In our home, the (very few) hours between waking and getting to church each Sabbath morning are very busy ones. We get up, get breakfast on the table (waffles, a family Sabbath tradition), take turns wrangling our 1 and 3 year old boys while the other parent showers, get dressed in the clothes we laid out the night before, brush teeth and hair, make sure the diaper bag is stocked and ready to go, get everyone buckled into the car, and drive the less than two miles to church. And we get there late. And that’s if my husband is able to go with us. Many Sabbath mornings my husband, who is a pastor (one of a handful at our large church), has to leave pretty early for church, meaning that anything that needs doing after breakfast will be done by me. So…usually that means we get there even later. We’re working on streamlining the morning so that we don’t keep being late, because being prompt is actually important to us, but the point is that it’s not always easy to get to church on time with little kids. If you’ve got little ones (or even just one child), I totally get it. Getting to church isn’t easy. And getting there is only half the battle. It’s not easy for kids to sit through church. They’re antsy, they get bored. They think that whisper-yelling is what you meant when you told them to be quiet, they’re hungry, they’re thirsty, they have poopy diapers or need to go potty, or they’re running down the aisle (which is when you lose your last shred of dignity whisper-yelling for them to come.back.right.now.or.else. I’m not going to tell you that there’s a magic way to make church fun for everyone. I’m not going to say that if you follow my special formula, you’ll have perfectly behaved toddlers in your pew each week. I wish I could do that for you, but I haven’t cracked the code yet, so I can’t. The first step to making church more enjoyable for you and your kids is to come prepared with everything you’ll need. Every kid is different, but I’ll give you a basic idea. Church toys: Again, the details are in this post, but (again) quiet is key. Church appropriate changes of clothes: Consider bringing one for you AND for baby. You’ll also need to remember that this too shall pass. Whatever stage your kids are in, it’s not going to last forever. If you’re never able to sit through church and your pew is a hot mess of toys and crumbs and torn up tithe envelopes, try to remember that it’ll be different in a few weeks (or maybe a couple of months). God sees you, mama, and He’s with you, and He’s probably chuckling thinking about how it was when you were a kid doing the same to your mama, too. Hang in there. My post, What’s in My Bag? 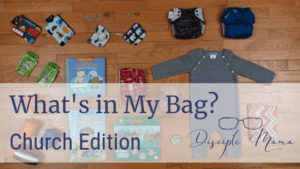 Church Edition, includes a peek into what’s in our Sabbath bag, so check it out for more details on church snacks, toys, and even a bonus church clothing tip! Obviously just keeping kids occupied in church is not our discipleship endgame as Christian parents, and it doesn’t really feel meaningful and fulfilling to chase our kids down the aisles or drag them out to the mother’s room kicking and screaming because you won’t let them crawl under the pews and rifle through people’s purses. In these moments especially, we’ve got to keep our eyes on the prize. Discipleship means meeting our kids where they are, and teaching them what we can to help them to learn and grow into their own relationships with Jesus. The Holy Spirit’s going to do His work on their hearts, but we’re tasked with setting an example and maintaining discipline, so keep at it with the end goal in mind. It will be worth it. We want to teach our kids how to participate in church so that they take ownership of their own churchgoing experiences. Helping kids learn how to stay quietly through the church service is one step in the process, but it’s only the beginning. As they grow, they’ll be able to become increasingly more involved in what’s happening around them, until they get to a point of full participation in later childhood. You’re the best judge of what your child is ready for, but be sure not to sell them short. Keep checking in with your kids to see what they’re paying attention to in church so you can gauge when they are ready to start participating more. Even if you think they’re just playing, they might be absorbing and understanding more than you’d think! In church, as with every aspect of parenting, we need to model the behavior we want to see in our kids. So, if you want your kids to learn and grow into singing during song service, you can’t just sit there while everyone else sings. Sing even if you’re a terrible singer. Teach your kids that it’s about making a joyful noise to the Lord, not about having the most beautiful voice. Expect your children to participate in prayer during the church service, and do so yourself. At home you expect your children to maintain a prayerful attitude and posture when you pray, so why not expect it at church? Yes, the prayers may be longer and different than they’re used to, but that’s only because they haven’t practiced it yet! My son has been going forward with my husband for the congregational prayer since he was a baby, and he knows how to kneel and pray reverently for it. Is he perfect? Nope. I’m sure I could catch him with his eyes open fidgeting around sometimes. But, he’s learning, and that’s more valuable than robotic stillness, in my opinion. We want our kids to learn how to listen to and understand the sermon. So, listen and try to understand the sermon! Take notes if it helps. Open your Bible and read along when the preacher references a text, and help your child find the text in her Bible, too. Go home and discuss the sermon over dinner, ask questions and recap the main ideas. This will help your children understand that the sermon isn’t just to fill time, but to actually make us think, learn and help us to study out biblical truths on our own. Our kids are always watching us because we are their primary teachers about how things work. If we model engagement in church, they will learn how to engage in church! It’s not going to happen overnight, but keep at it. Home is a great place to practice some of the behaviors that we want our kids to develop for church. I’m not telling you to role-play the church service every day or anything like that. Just take advantage of the teaching moments that present themselves here and there. During your daily family worship (which should be much shorter than a sermon, by the way), expect your kids to act reverently and respectfully. Obviously this will look different for kids of different ages and abilities. What I expect from my 3 year old is a lot different than what I expect from my 15 month old. When you pray together at home, teach your kids how to listen quietly to whomever is praying. Model the behavior you’re expecting. If you want your chid to close his eyes during prayer, don’t keep your eyes open to see how he’s doing. He’s probably peeking–we all know it–but that just means he’s going to see you open yours to catch him, and therefore he’s learning that it’s not really that important to close his eyes. It’s really just important to point out when other people open theirs. Explain ahead of time why you expect your kids to be quiet in church. It can be pretty bewildering for a toddler who, let’s be honest, barely even has an ‘indoor voice’, to be expected to take it down 25 notches all of a sudden when she enters the sanctuary. Practice talking in a whisper voice sometimes at home (my son thought this was fun…in fact he still does it sometimes without warning because he thinks it’s hilarious to whisper). We all participate more actively in events that we feel ownership of, and the church service is no different. 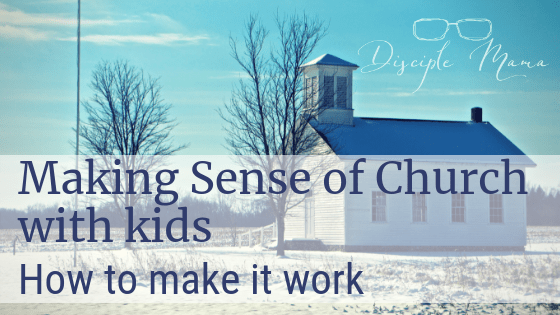 Our kids need to feel that the church service is theirs, just as much as it is yours. 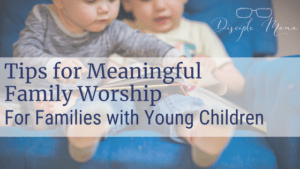 We often think of Sabbath School as the kids’ domain and the worship service as an adult thing, but that’s not how it should be if we want our kids to grow up feeling ownership of their worship experiences. Once your kids can sit through church reverently and respectfully with toys and snacks, begin working with them to actively take part in the service. Communicate your expectations ahead of time so that you’re not trying to reason things out during the doxology. Expect your kids to put snacks aside to participate in songs and prayers. Once they can read, expect them to open their Bibles for scripture readings. You can gradually replace toys with notebooks or scribble pads that can still be used to keep growing hands busy, but also to help your kids focus on what’s happening. When I was growing up my mom would find a clean page in my Sabbath notebook and write out 5-10 words in a grid on the page. Then I’d make tally marks under the words for each time the pastor mentioned them from the front. After church, my parents would ask me how many times the preacher had included the word “God” or “Heaven” or “love” in his sermon, and I would be able to tell them. I didn’t realize until I was much older that what they were really doing was training me to listen carefully to what the pastor was saying. Encourage your kids to participate in whatever they can do appropriately. If your church service includes a children’s story, have your kids go to the front for it! If they’re too nervous to go on their own, go with them. My husband takes both of my boys to the front every week (unless he’s telling the story, in which case I take them). E is getting old enough now that he could probably go on his own, and we let him sit away from us sometimes now. It may not seem like a big deal for your child to skip the children’s story, but once you start ignoring parts of the church service, you’re giving up ownership. Help your kids to see that the story is for them, and that it’s worth being a part of it. If your church asks for prayer requests from the congregation, encourage your kids to share what’s on their hearts, too. Prayer is for our kids, and church is for our kids. When they participate, they own it. During church, you can (quietly) narrate different parts of the service to help your child understand what is happening. I know when I visit a new church I often feel unsure of what’s happening and why, so our young ones must feel that way about church sometimes, too. For example, during a baptism, quietly explain why the pastor and the baptismal candidate are standing in the water. Don’t go into depth right then and there, keep it simple. Baby dedications, ordination of elders, offering collection, and communion symbols all deserve some narration. Once you get home you can talk about what happened during the service in more detail. 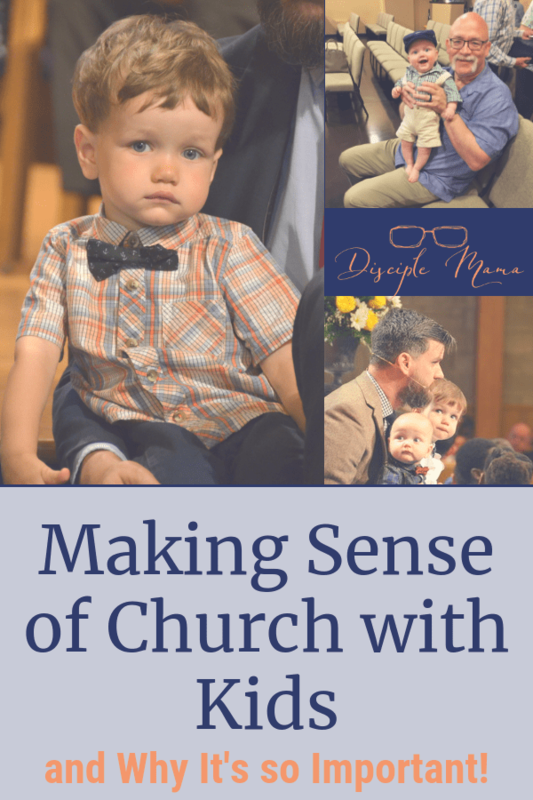 Your child may not understand the meanings behind the different things that happen at first, but as they keep experiencing the different things that happen in church, they will learn and understand more. Don’t wait until your kids are teens (or longer) to get them plugged in to ministry responsibilities at church. Kids are more than capable of performing many of the vital roles necessary for healthy church functioning. Music– Does your child love music? Help him to learn the hymns and praise songs that you sing in church! As he gets older, help him get involved in leading out as part of a praise team or offering a special music. Scripture reading-Does your child memorize scripture well? Find out if she can recite the scripture ‘reading’ one Sabbath. Call for offering– Maybe your family could do a call for the offering together! Being up in front of the congregation might be too daunting for some kids at first, but if you are with them, they will feel much more comfortable. Children’s story– A boy who loves to tell stories might be able to tell the children’s story one Sabbath (with help from a parent or pastor). A/V team– Older children with interests in technology may be trained to help run your church’s sound system, or run the PowerPoint for the pastor’s sermon (if he or she uses one). Greeting– Smiling kids make wonderful church greeters. Wouldn’t you be happy to come to church if a little one was the first to welcome you in? The possibilities for getting children involved are endless, really. Of course, the younger your kids are, the more support from you they’ll need to perform whatever church responsibilities they have, but honestly, it’s worth the commitment your family will be making to help your kids find their roles–first in the church service, and ultimately within the Body of Christ. You guys, it’s true. We have to affirm what the Bible teaches us about young people being worthy of spiritual thought and even leadership. It doesn’t matter how young your kids are. Start now, and teach them that they ARE the church. And church service will get easier, little by little. I promise. Wonderful article! As a mother that intentionally tried to make church important when my children were very young (and felt every week like a rag doll by the end every time!) I struggled to glean anything meaningful out of the service. Then I was asked to transcribe the sermons for our TV ministry. I finally discovered a time I could experience a Sabbath worship! I quit desperately trying to focus on what the pastor was saying in church and instead focused more on helping my children understand what was happening, because I knew during naptime the next week I would get to listen to the sermon totally uninterrupted. It helped change my Sabbath outlook dramatically. Not every church records their sermons, but there are certainly a plethora of them available online, and it’s easy to find ones relevant to a young mom needing spiritual encouragement! Jennifer, I’m glad you enjoyed this post! You bring up a great point that maybe there are other ways that moms can get a blessing from the sermon, even if it’s not at church! Thanks for pointing that out, and I’m so glad that you found a way to work around (and through) those feelings that Sabbath is a lot of work instead of a blessing! Thank you for visiting my blog and sharing your insights! I absolutely LOVE this article and the wonderful tips. We have a 2.5 year old and a 10 month old — boys! My husband is a deacon and I’m one of the worship leaders and our Sabbaths on duty happen to fall on the same Sabbath, but we are blessed that my mother-in-law attends the same church and helps us with the boys. However, there have been many times when we have taken the kids out of the sanctuary. I don’t particularly care for the Mother’s Room at our church so we will walk them around the courtyard or take them to the cradle roll room. So much has happened this year: I had our second baby, my mom was diagnosed with cancer and sadly died, we just moved in with my dad, etc. that we have rarely made it to church on time… and I am a very punctual person, so it really bothers me when we are late. It is so comforting to hear that other parents with young children struggle with similar challenges and it is not that I am failing at being a mom and at life in general (because sometimes it feels that way). Anyway, sorry for the long reply. Thank you for this! I will be coming back to read it again and again! Jacquelyn, if you’re failing we’re ALL failing! I haven’t gone through nearly what you’ve been through this year and I don’t have it together. Hang in there and keep looking for the reminders that God’s hanging in there with you. I’m glad that have found some encouragement from this post! Your boys are similarly spaced to mine, and it can be a handful, but so much fun, right?! Come back and visit as often as you like! Blessings to you and yours. Lots of great tips here! I especially liked the one your mother would do with the words. I will have to try that with my six-year-old. It sounds like you go to a church that welcomes children (and I do too). However, I have heard too many stories of mothers being made to feel bad when their baby screamed or toddler started misbehaving. That is why your husband’s quite resonates so much with me. Thanks again for another great post! It’s true that I’m in a church that welcomes children, churches of my denomination generally do, which I think is a blessing. But there’s always the chance that someone will do their best to make you feel bad when your kids aren’t on their best behavior in church. I think that’s part of the reason that we, as moms, need to have a clear idea of what the end game is so that we can be sure of our purpose when others try to tear us down. 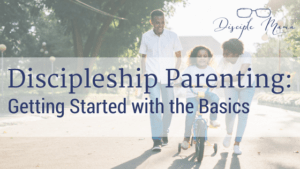 But it’s easy to feel like all eyes are on you when your kids are misbehaving, so I think ideally we should work toward getting pastors and fellow church members on board with discipleship of our kids so that they’re working with parents and not against us! I think your six year old would probably love the word game! I always did! Thanks for visiting the blog today, Luisa! Great ideas and encouragement in this article! Our family has been serving as Ushers/Greeters about six times a year at our church for the past six years and with my sons now 16 & 17 years old, it’s something we all look forward to doing together. I love the quote from your husband, and I do pray that my boys grasp the concept that we are the church. Jamie, it’s so fabulous that your family serves together at your church! I love it! Thank you so much for visiting my blog again! Come back again soon. As a father of four children I did struggle with securing the youngsters full attention and will participation. Church can be such an adult environment, even in the more informal Churches. You are so right – what is not practised / done / lived out at home, will be alien to children when they experience it elsewhere – including Church. Four children would be a challenge! It can be difficult to help our kids feel comfortable and happy about being in such an adult-focused environment, but so worth it! Hopefully more churches will embrace being a family-centered environment that has more to offer all attendees. Thanks for visiting my blog today, Bob! I came from the old school ‘children should be seen and not heard’ mentality, especially in church. This article is a very different perspective and I love the tips on how to keep kids busy in church, yet teaching them to be engaged as well. This is a wonderful article! Erica, thanks so much for sharing! It’s interesting how things shift over the years, isn’t it? I will say, though, that the shift here is far from complete, and mothers with little ones still probably receive more than their fair shares of sideways looks from other church members! But I think that some allowance should be made for less-than-perfect behavior from little ones who are still learning. Our ultimate goal isn’t perfect stillness, but actual engagement and enjoyment of the church service, and that must be intentionally taught to little ones. Thank you for visiting the blog today! Our church has children’s programming (Sunday School) and nursery during each service, which is very convenient for parents. It’s not a perfect solution, though. I also volunteer in the children’s ministry by teaching a Sunday school class, and it means I miss 50% of the services because I teach 2 Sundays a month (I can go to another service time, but it would be going alone because the service I teach during is the one the works with my toddler’s nap schedule. I don’t usually like to go alone, plus while church is very important, so is family time and rest after an incredibly hectic week). I also sometimes feel like I’m missing out on the opportunity to teach my son what church is all about and how to help him participate appropriately. But I suppose there will be a time for that. Once he is older (he is 4 right now), we can start having him “skip” Sunday School to sit with us. These are great tips for a family that needs to make a service work with their kids in attendance with them. Thanks so much! Holly, that’s very interesting! I am a Seventh-day Adventist, and our churches all have children’s programming (we call it Sabbath School), but it’s never at the same time as the church service (unless it’s a large church with multiple church services), because we highly value the intergenerational worship experience in addition to the age-specific programs. So, a common schedule at an SDA church would be to have Sabbath School classes meet from 9:30-10:45 and then the church service at 11:00. There are Sabbath School classes for adults, too. Some SDA churches have implemented additional Children’s Church programs during the church service, though at most churches it only happens once a month (or less frequently than that). I can see how convenient it would be, but something about it just makes me feel like we’re doing kids a little bit of a disservice to not teach them how to enjoy worshiping in a room with people of all ages. If I had to choose between Sabbath School and church service, though, I would have a hard time giving up Sabbath School for my kids because they love it so much. Thank you so much for visiting my site today, Holly, and for sharing! I love learning about how other people are experiencing church and navigating this early parenting within the church setting. I love this!!!! I’ve been working on ways to engage my 7 year old since our church currently doesn’t have children’s church so he gets bored. I want him to stop taking action figures to church so I’m trying to move him towards pen and paper activities. I love the ideas here, will definitely be re-reading! Takhia, thanks for visiting my blog today, and I am so glad you liked the ideas in my post! Children’s church can be really great, but I really think that the experience of intergenerational worship of an inclusive church service is more valuable in teaching kids lifelong churchgoing habits. I hope you have success moving from action figures to other activities for church! I’d love to hear how it goes! Well spoken! We need to model what we want our kids to do – at home as well as in church! There is indeed a LOT of planning involved in that statement too! Planning takes the confusion out and everyone involved knows whats “expected” of them. I am a Pastor’s wife and felt the pains of bringing my kids to church many times by myself. It’s hard enough to have obedient kids at church let alone them be the “PK’s” (Pastor’s Kids). So my weapon was lots of planning and talking and explaining exactly WHY we do WHAT we do – not the painful “because I said so”. Kids are curious and more understanding when they know WHY we do things and WHAT things are for: like what the offering envelopes are used for, why church is as long as it is, what the songs mean, etc… And lastly, this too WILL pass! I have 2 healthy, surviving, PK’s that are now adults living for the Lord!!! Christa, you’re so right! The planning does involve a lot of time spent answering questions! It does help a lot for kids to understand and be expecting as much of what will happen in church as possible, so that they have things to look forward to, and so that the situation feels as comfortable and familiar as possible. Thanks so much for visiting my blog today! Come again soon! You’re doing all the right stuff for all the right reasons! This was how we raised our six children with structure and intentionality and lots of communication, Believe it or not, these days when they’re small are the “good ol’ days.” You’ll look back on these days of torn tithe envelopes and crushed church food with fondness, for your kids will one day no longer need you. These days are a gift and a blessing. They are the most intimate times you’ll ever be able to serve them as you train them so carefully. These acts of training are a great blessing, for you are training them for Jesus. Before you know it, they’ll be grown. Cherish even the “bad” days, for they will fly by. God bless you, Brianna! Thank you so much for the encouragement, Melinda! I’m sure I’ll miss these times someday, as trying as they can be, because I already miss the days that are behind me with my babies! The beautiful thing is that what comes next is always wonderful in its own way, too! I pray that my boys will be deeply rooted in the truth and hold strong when future storms come their way. That’s what training is all about! I’m glad you visited the blog again, come back anytime! This is so good! I’ve sat through a handful of services since having babies so it is encouraging to be reminded that someday, we’ll sit through service again. I love your tips on getting kids involved in the service, that is important! Making a word grid is such a cool idea, I’ll have to remember that for later! Yes, Elizabeth, one day! I sure loved the word grid game when I was a kid, so I’m hoping my son does, too, when he’s just a little bit older and able to read! Thanks for visiting the blog! Great tips! Our church runs children’s church at the same time as the main service. There are some pros to this, but a definite downside is when the grade sevens move into the main service they feel a little lost. I like the idea of getting them involved. My one son would be a good greeter, and the other is good at technology so he could maybe help with the PowerPoint! Thanks for these great ideas. Yes, I can imagine that it all might be a little bit overwhelming for kids if they’re not integrating into the regular church service until suddenly in 7th grade. It’s so great that you have a good idea of where your boys could get involved, though, and I hope that your church leaders are excited to put them to work, contributing positively to their church community. Thanks so much for visiting my blog, Katrina! Come back again, soon! It’s about making a joyful noise, not about a perfect voice! We actually attend the early service at our church (it’s at 9:00 am, so not TOO early), and it fits into our schedule a lot better than the more popular service that starts at 11:45. That way, my boys can still make their afternoon nap time! Do what works! Thanks so much for visiting my blog today and offering your comments, Laurie! Jennifer, it’s so sweet of you to visit my blog when you don’t have any children yet! I love it! Thanks for reading, and come back anytime! Oh my, our mornings are so similar, wrangling our three kids to get there late and then ‘enjoy’ church. I love your perspective that we are all in this together and that we do what we can, and the ultimate goal is to model worship for our children. It’s a noble goal with eternal value. Great tips! We really ARE all in it together, and I’d love for this little corner of the internet to be one in which mamas feel safe to admit our struggles and support and help one another, rather than judge and tear down. There’s a lot of that going around in the world, and we just don’t need more of it! It’s not always easy to enjoy church (at least not in the same way we used to) with young kids, but it’s so important to get their roots down in church so they’ll stay there when they’re older! I’m so glad you stopped by the blog today and I’m glad you enjoyed my tips, too! I hope church went smoothly for you this weekend!